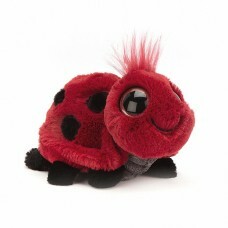 Frizzles Ladybird is a goofy garden pal, with a stitchy-sweet smile and the biggest shiny eyes! This flitting friend has raspberry fur with chunky black dots and a cordy grey tummy for top bug snuggles! With six soft legs and stretchy feelers, this ladybird is picnic-perky!